The Boulder Cycling Club is an open club for all skill levels. We see a number of new faces on many rides and we are happy that you have joined us. Many new cyclists in Boulder have never ridden in a group before. Heck, many experienced cyclists have never ridden in a group either. We often get asked, “What do I need to know before my first group ride?” This is a fairly loaded question since there are many different opinions on the subject and each group, team and club had their own policies, rules and etiquette. 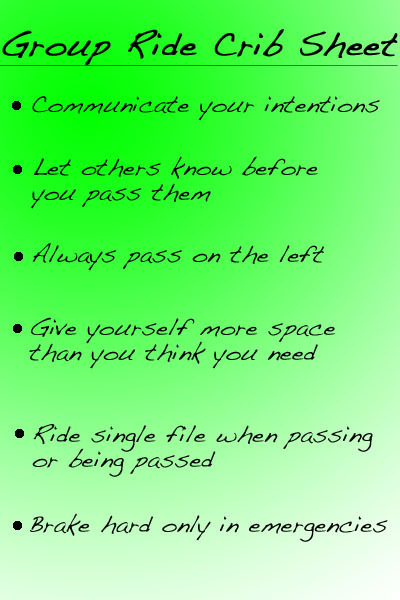 I’m going to cover a few basics that should be universal in any group ride. If you remember nothing else, remember this, communication is paramount. Nearly everything that helps reduce risk on a group ride can be traced back to communication. It is almost impossible to over communicate with other cyclists while riding in a group. As communication goes up, risk comes down. Vocal communication is often the most effective way to communicate with other riders as well as cars and pedestrians. Tell the other riders in your group your intentions and let them know if you have a mechanical problem and need to stop. Let us know if it is your first time riding in a group. It can be a little intimidating, but we’ve all been there. No one will look down at you, but we will know to give you a little extra space and keep an eye out for you. Cyclists often use hand signals to indicate slowing/stopping, turns and road hazards. People have their own ways to indicate hazards and some will point out every manhole cover while others only point out potholes that are large enough to swallow a Buick. If it can cause a flat or someone to lose control, it’s worth pointing out. The closer you are riding to others, the more important this becomes. However, the catch 22 of hand signals is it requires you to take a hand off your handlebars, which can increase stopping distance or decrease your level of control while rolling over rougher patches of pavement. If you are breaking hard (something to be avoided in general, see below) don’t signal it with your hands, get those vocal chords vibrating and yell out “slowing” or “stopping”. Hazards can be pointed at, but some people will wave to the left behind their back. This usually means there is something unusual in the road ahead like a trash bin or a long patch of gravel. If someone in front of you points up, there is probably a low hanging branch. On bike baths it is courteous to let pedestrians know you are about to pass them. Give them as much room as you can and plenty of warning (3 seconds or more), and slow down while you pass. It’s a ride, not a race. Add 1 additional second of warning time for each adult in the group you are passing and 2 seconds for every child or dog in the group. Reduce your speed another 10% for each additional adult and 30% for each child. It is also helpful to include the number cyclists in your group, like “8, on your left” or “group on your left”. Watch out for oncoming bikes passing pedestrians. When passing bikes, always pass on the left, and announce yourself to the rider in front of you. If the road isn’t clear behind you on the left, don’t pass. You may lose some momentum, but it’s better than getting taken out by a car or another bike that is looking to pass you. Check over your right shoulder to make sure you don’t cut off the person you just passed. When you are checking behind you, hold your line. It is a natural tendency to drift left when looking over your left shoulder and vice versa. If someone is passing you, hold your line or move to the right if you can do so safely. It’s best for a group to pass other riders one at a time, single file. A little patience is sometimes required, but again, it’s better than being taken out by a car. Avoid passing while going around sharp corners. If for some reason, you must pass someone on the right side, be extremely vocal about it. If you don’t know the route, don’t pass the ride leader. Some groups consider it poor form to continuously pass a person on the downhills and then get passed by the same person on the uphill. Others don’t care. If you are in a group ride that allows close riding, again, the key here is communication. When in doubt, give yourself more space. Sometimes the only communication the rider in front of you will give is they stop pedaling or their back brake starts to close. It is true that the closer you are to rider in front of you, the more benefit you will get from drafting. You don’t, however, need to be a few inches away from the wheel in front of you to draft. Triathlon rules indicate a 7 meter draft zone because you can benefit from being even 2 bike lengths behind. It takes a while to get to know the cyclists you are riding with and it takes skill and predictability to safely ride really close together. 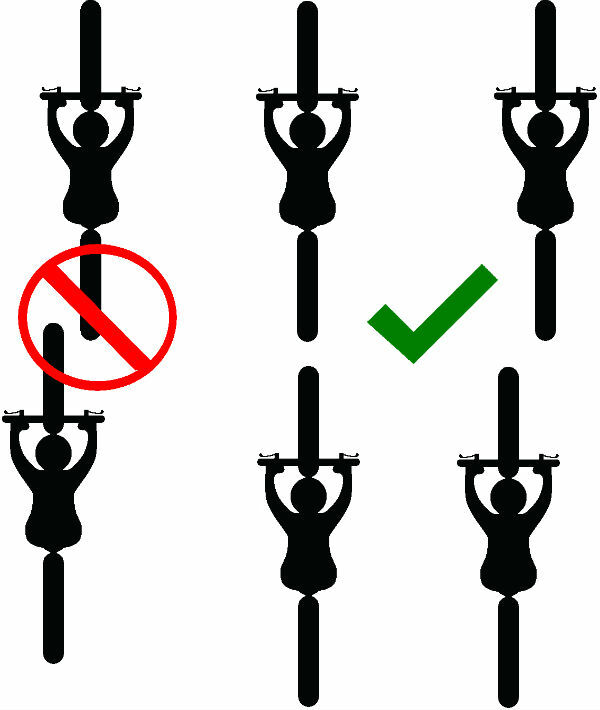 Group rider newbies should keep a minimum of half a bike length. This puts your eyes in a great alignment to watch the rider’s feet and back brake at the same time. 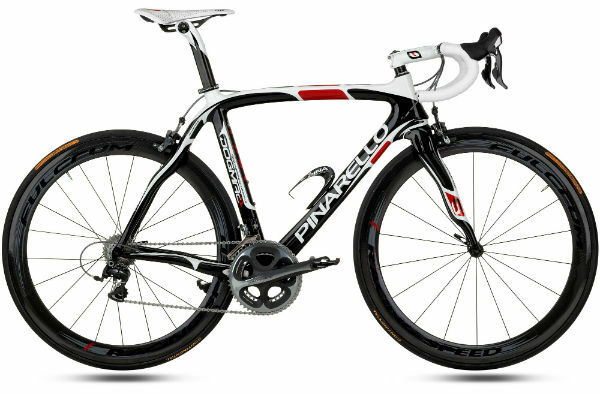 Also, using aero bars in a group is a big no-no, save them for your solo rides where they really shine. How closely you can safely draft is largely a function of how well you know the other cyclists in the group. Knowing their strengths, weaknesses, and skill level allows you to better predict what they will do next. Either way, don’t overlap wheels. One of the most dangerous situations is for you to rub your front wheel against the back wheel of the person in front of you. The rear wheel on a bike doesn’t turn side to side, so the rider in front of you will probably be fine, but your front wheel does and you can easily lose control. Colorado law allows for two abreast in bike lanes (if you are actually in the bike lane), on bike paths, and when you are not impeding the flow of traffic. 3 or 4 abreast can be done if you are have a very wide shoulder, but is generally best avoided. Regardless, use common sense and tuck into single file when a car is passing the group. If you find yourself having to fall into single file because there are a lot cars, just stay in single file. There are already enough malicious drivers out there that will intentionally try to run you off the road. Let’s do our best to not piss anyone off and create any more of them. It’s better to pick a different route than to pick a fight with a 3000 lb vehicle traveling at 55 mph. When going around blind corners, ride single file. Colorado Department of Transportation has put together the Bike Ped Manual for all laws specific to cycling in Colorado. Don’t slam on the brakes unless it is a true emergency. Road hazards (even prairie dogs) are not a true emergency. Nor do they warrant a hard swerve when riding closely in a group. Stand up in your pedals and ride it out. If you can, pull up slightly and lean back as your front wheel goes over the furry creature, then shift your weight forward as your back wheel rolls over the sucker. Remember, our urban development has killed or scared off most of the prairie dogs’ natural predators. Most likely they will scurry out of the way before you hit them anyways. Again, communicate with others as much as possible and pay attention to avoid these hazards. It’s ok to feather your brakes to reduce your speed. Coasting is better than braking, but it tends to have a yo-yo effect on the riders behind you. It’s best to soft pedal and sit up a little higher to let the air resistance slow you down, assuming that is enough to keep a safe distance from the wheel in front of you. Aim for smooth, steady and predictable. On the same note, while riding alone, practice holding your line when getting a drink from your water bottle. There is a natural tendency to drift to the side while doing this. Shift down to a much lower gear before you come to a stop. Centuries and charity rides can often start with really large groups (50-2000 riders). Ideally, you don’t want to have this as your very first experience riding in a group. It best to start out on a group ride of less than 10 people, but if you do find yourself riding with 300 of your closest friends, don’t worry, you’ll be ok. All of the above still applies and… you guessed it, communication is your best tool. Most likely these rides will be organized and supported with aid stations and will require registration. Check with the organizer’s rules and ask if the roads will be open to traffic. Most likely, they will be unless it is a really big event. For rides with more than 500 people, you’ll probably be assigned into a wave of 50-100 others. This keeps things more manageable for the organizers and is generally more enjoyable and safer for the riders. Remember it’s a ride, not a race. You can push yourself hard, but it’s not worth getting yourself or others hurt. You are most vulnerable during the first 5-8 miles or until the group starts to spread out a little. Riding 4-6 abreast in the beginning is common, but might be illegal depending on other traffic. If you find yourself 6 abreast, change your speed to get out the situation to give yourself more room. It’s not worth it. If there are aid stations, you’ll be expected stop and get off your bike before approaching the tables. If you decide to skip that station, keep your distance and slow down just like you would if you are passing pedestrians, because you are. Cycling is a lot of fun and you are more visible to motorists in a group than riding solo. However, group riding can have its own risks. Communicate with the rest of your group and it should be smooth sailing for your first group ride.